Any residents of Oswego that would like to make their food dollars go farther may order July Food $en$e packages until Noon on Friday, July 15. All Oswego-area residents may use the program. There are no income limitations and no restrictions on the number of items one may buy. The July package contains chicken drumsticks, tilapia fillets, fresh eggs, fresh potato salad, frozen broccoli cuts, ground beef, hot dogs, elbow macaroni, pork and beans, canned fruit salad, and fresh produce. Payment of $15.50 or by EBT card must accompany the order. Complete size and price information will be available at the time of ordering and the order form may be seen on Facebook: The Salvation Army - Oswego County Corps. Additional July specials at various prices include frozen boneless skinless chicken breasts, beef sandwich steaks, meatballs, French fries, BBQ chicken wings, breaded shrimp, and Stouffers white cheddar pasta bake. Specials may be ordered with or without ordering the monthly package. 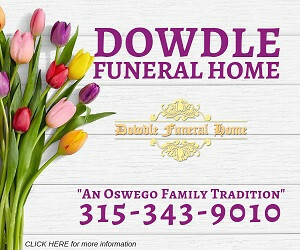 Orders may be placed in person at the Salvation Army Worship and Service Center, 73 West Second Street, Oswego, Monday through Friday, 10:00 A.M. to 3:00 P.M., through Friday, July 15 at Noon. Orders may be placed by mail but must be received by Wednesday, July 13, with the envelope marked “Food Sense” on the front. Mail to The Salvation Army, PO Box 146, Oswego, NY 13126. Orders cannot be taken by phone. Food orders must be picked up on Thursday, July 28, between 11:00 A.M. and 1:00 P.M. Bring your copy of the order form. The Food $en$e program is a service of the Food Bank of Central New York. The Oswego County Salvation Army is the official site for the City of Oswego and vicinity. A basic assortment of food items is offered each month, along with a number of specials. The Oswego County Salvation Army Corps provides fresh-cooked meals five days each week in both Fulton and Oswego, groceries from its food pantries, winter garments, and many other services to individuals and families in need throughout Oswego County. Persons wishing to know more about The Salvation Army or offer voluntary service, are invited to call 343-6491, or stop at the office at 73 West Second Street, in Oswego, between 1:00 and 4:00 P.M., Monday through Friday.